Our first Belize trip was in 2004. After many family negotiations, we settled on Placencia. Its a small community at the end of a long peninsula. 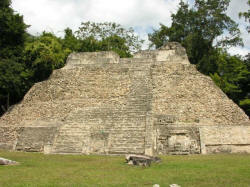 We had a wonderful time and went back to Belize again in 2005 to see different parts of the country. No doubt we'll go back again in the the future. The links above take you to trip reports for those visits. They attempt to explain how we decided what to do and where we went. Hopefully, they are entertaining as well. The Caye Caulker and San Ignacio trips were in 2005 and were really part of the same trip. We spent time at the beach and in the jungle. They are broken up since they felt like two different trips and to cut down on the page sizes. In February, 2006 we went back to Caye Caulker for a short visit. Again a very nice visit and we have many more pictures. February, 2007 found us in Caye Caulker again. We were supposed to leave Sunday and arrive Sunday. We planned to meet our daughter in Belize City and work our way over together. That didn't work out well but we have a great visit anyway. In 2008, I wanted a change. We looked at Roatan and places in Costa Rica. After all that, it was back to Belize. The difference was we went to Ambergris Caye for a week. We had a good time and met a lot of nice people but still prefer Caye Caulker. There are also many pictures available, either by clicking on this link or from the individual trip reports. Additional information and thoughts on Belize can be found here.